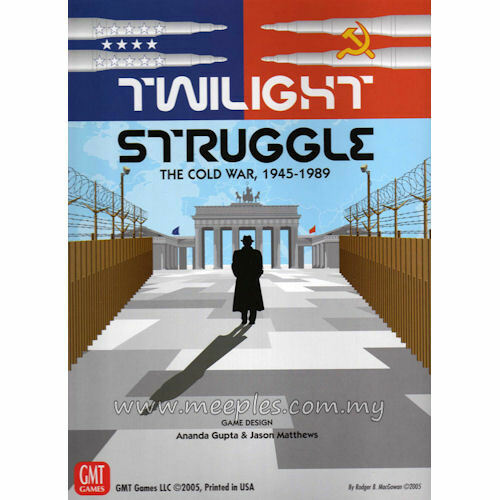 Twilight Struggle is a 2-player game simulating the 45 year dance of intrigue, prestige, and occasional flares of warfare between the USSR and the USA. The game begins amidst the ruins of Europe as the two new superpowers scramble over the wreckage of WWII, and ends in 1989, when only the U.S. remained standing. Twilight Struggle inherits its fundamental systems from the card-driven classics We the People and Hannibal. Players move units on the world map and exert influence in attempts to gain control for their superpower. Twilight Struggle's Event cards add detail and flavor to the game. They cover a vast array of historical happenings. including the Arab-Israeli conflicts, Vietnam, the peace movement, and the Cuban Missile Crisis. Subsystems capture the prestige-laden Space Race as well as nuclear tensions, with the possibility of game-ending nuclear war. Can you, as the U.S. President or Soviet Premier, lead your forces to victory? This is the newer Deluxe Edition and has a fully mounted map, 6 additional cards, thicker counters (same quantity) and a lower retail price.